The Conference Room in Manchester Central Library was packed with eager listeners for this event with three of our poets and their translators. It provided a very grand setting, with panelled walls and high sash windows. By the time we kicked off it was standing room only and there must have been at least sixty people in the audience. First, Lavinia and Nukhbah read their translations of Noshi Gillani's work, and Lavinia explained how the translation process had felt a bit like unpicking some very tight and complicated knots. Nukhbah provided some more context for Noshi's writing, explaining the significance of her stance against the oppression of women in Pakistan and the subtle expression she gives this conflict in her poems. 'The blood is still alive in the nostrils of the telephones', in one especially powerful passage that connects the struggle for Cape Verdean independence with the bitter fighting in Northern Ireland. And last, but by no means least, Gaarriye and W N Herbert read the four poems contained in our chapbook (which, incidentally, you can order direct by mail or email). 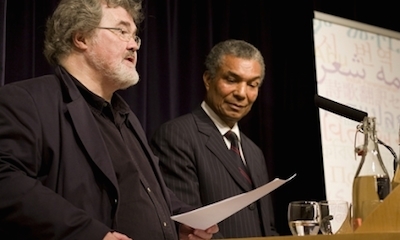 Bill also paid tribute to Martin Orwin, whose invaluable work with Gaarriye and whose unique expertise in Somali culture and language made these translations possible. And then Gaarriye was off, gesticulating widly and folding the book in his right hand like a napkin. A group of Somali boys from the local school had come to see him read and their laughter burst out again and again as the poet paused for emphasis and gave the audience a knowing wink.